Often times when people hear that I’m a minimalist they assume I am a hippy who lives entirely off the earth in a corn fueled van and I have renounced all my possessions. I have tried to be quite clear that minimalism to me is about simply clearing the clutter to get back to what’s really important. Despite my efforts, some people will never understand; and I’m ok with that. Beyond clutter and possessions, there is something much deeper that is plaguing the entire world now more than ever: depression. Minimalism for me has never been solely about stuff or what I own. It runs deeper than that, to a place that no one can see. After our family moved from a townhouse into a large 3,400 square foot home we never could have imagined that this big upgrade in life would actually start tearing us apart. 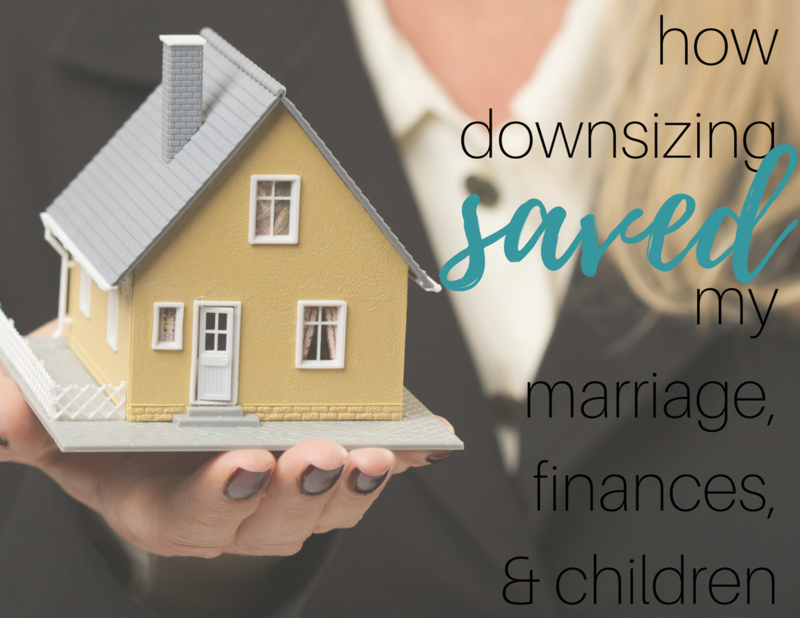 You can read the full story about our downsize here: How Downsizing Changed Our Family. I touch a bit on why we decided to downsize and what went down to make it happen. Today I want to reflect after a year and a half, get really honest and break down for you exactly what has changed in our lives for the better since the day we ditched the big house for a tiny “starter home.” Basically how downsizing helped our family overcome depression, avoid divorce and reunite us as a whole. When I think back, smack dab in the middle of our time in the “big house” (this term fits perfectly because #1 it was a big house and #2 it’s also what they often call prison.) our marriage was suffering more than ever. On more than one occasion, I told Tom I would keep fighting but didn’t now how much longer I could go on. The truth is, his depression began the day we signed the papers to our new home. He was plagued by the payment but felt like we couldn’t back out. Our realtor really wasn’t much help. While I did my best to remain light, cheery and reassuring, Tom continued a downward spiral. Some days he would love the house (it was a beautiful house) other days he was distant to everyone. He stopped helping me around the house like he used to. While the words were never said, I know he grew resentful of me. Even though the day before we purchased, I had told him if he wanted to back out, I supported him, there was still a part of him that blamed me. The blame had to go somewhere, right? That was a heavy weight for me to bare. He grew more resentful of the house and every dime we put into it. Even though we continued to be fine financially. Amidst all of this, our oldest daughter fell right off our radar. She was so excited to have a bedroom in the basement with her own bathroom and some much needed pre-teen/teen privacy. We rarely saw her. I was quick to shrug it off as “just being a teenager” and would roll my eyes. Little did we know just how much she was falling into depression, her anxiety was worsening and she felt majorly disconnected and unwelcome by our entire family. In the townhouse, she was constantly having sleepovers, parties and friends over. She already lost some of this when her siblings were born after 9 years of living as an only child (with the exception of an older sister who was raised separately from her.) We knew she struggled adapting to the changes of siblings, and had no idea just how much “the big house” as affecting her. I don’t think she was aware of it either. All the time I had not speaking to my husband or oldest daughter sure gave me a lot of time to read. Thank God. I read books by Wayne Dyer mostly, books about gratitude, living in the now, and how important life is…not stuff…life. I am currently reading Brene Brown’s book, “Rising Strong” and in it she says it takes one person wanting to change and it can lead to a chain of events that change an entire family’s life. I felt like that most days. I felt like if I was happy enough, it would make everyone else happy. If I stayed positive enough, eventually everyone would believe it. Well, after 2 years of being in the “big house” my attitude and my positivity just weren’t enough. Action needed to be taken. I had loved the big house when I first saw it. Mostly, I loved the windows. They let in so much sunlight and it brightened my days having constant streams of sunlight glaring in every morning. Then I started to think, “Are windows really something I should be putting in front of my marriage?” Because honestly, the house had started to feel like a death trap. I found myself wondering how in the world I would ever fill it with enough stuff! There was so much space. So much space to fill meant so much left to do. When we were done filling it with stuff, we’d probably start re-doing the floors, putting in a fence, a deck, a new shower…the list of house work seemed to be endless. Would I be spending the next 30 years of my life just accumulating stuff and working on a house? Would it ever feel like a home? When I began to think about these things, it was like a veil had been lifted and I was able to see clearly. I knew I didn’t want to spend decades just working on a house, I wanted to have a home. I wanted a home for me and my family. A place that felt safe and comforting. The big house hadn’t done any of that. It had only given us more space to distance ourselves from one another. There had only been one house in my entire life that gave me that sense of comfort, familiarity and peace. It was my grandma’s house. My grandparents would pick me up when it was my weekend with my dad. I spent so much time playing in the basement, running around the backyard, hiding in closets and even just laying on the couch enjoying the sun coming in from the big bay window. That’s what I wanted for my children and it didn’t require space, or a loft, or 3,400 square feet. My grandma’s house had been about 900 finished square feet and in those 900 square feet were some of the best memories of my life. As my photography business grew, I was forced to fill the house with even more stuff. Props, backdrops, lighting equipment… It makes it hard to breathe just thinking about it. Imagine being in a room that keeps filling up and you feel obligated to add to it! There’s so much stuff that you can’t even reach those you love anymore; too much is in the way. I sat down with Tom one day and I told him, “Let’s sell the house.” He never had his full heart in it, and it had made him distant from me, from the kids and he was even struggling at work. (He had also missed out on a promotion opportunity amidst all the stress of the house.) As a natural worrier, he tried to find every reason why selling wouldn’t work. We hadn’t lived there long enough to gain much equity, it would be hard to find another house in the area, he didn’t like packing, I wouldn’t have the studio anymore… Whatever excuse he could find, I was ready to knock em all outta the park. I reassured him that any problems that came at us, we would be able to tackle them and ultimately start living a life that we wanted to live. One big life change that I have to give “the big house” credit for is changing my idea of money. There was no difference between how we spent our money the entire course of our marriage. Whether we were in an apparent, townhouse or the “big house” we paid our bills and then did whatever we wanted to with the rest of the money. After 2 years paying a bigger mortgage ($700 a month bigger) it dawned on me…that whole time when we lived in smaller houses…we could have been saving $700 a month. Instead we were blowing cash left and right on whatever new fun thing came our way. We lost $700 a month to our mortgage and yet we were still financially ok without $700 in our pockets. A move to a smaller home would mean getting that money back in our pocket and spending it wisely this time around….or should I say saving it wisely this time around? It also meant we would rely less on me working and I could dig deeper into being a better wife and mother. The kind of mother who notices that her daughter desperately needs her help. Moving from “the big house” to our starter home sized house, we did our best to keep our oldest daughter in the same school district. Her anxiety was high just having to transition from one house to the next. She didn’t want to leave her privacy, her bedroom and private bathroom and I totally understood that. She was not at all excited about our move. I could tell she didn’t like our new home, but it wasn’t her call to make. Since our new house had a completely unfinished basement that meant either having a room upstairs (while her siblings shared) or setting up camp in a concrete basement with no bathroom and way less privacy. She chose concrete basement…because the idea of being upstairs with us was just too much torture to handle. (teenagers) We told her we would finish her room in the basement as soon as we were able to. Tom and I also knew we weren’t about to take out any more loans or dig ourselves any more debt; so that room would be built when we had saved enough money to get it built. I did my best to promote the “coolness” of having a room in the basement. We hung different curtains up for walls, I encouraged her to pain on the concrete…anything she could do to take advantage of the space she had. Besides the bedroom, this change also meant she had to use the bathroom upstairs and share it with a 5 and 6 year old. Not exactly a teenage dream, huh Katy Perry? I get that this sure doesn’t sound like we “saved” her at all, but rather made her life a living hell. Just gimme a minute. Currently our marriage is stronger than ever. It pretty much has been since the day we moved into our starter sized home with our family of 5. There is so much more freedom financially in our lives. There is also freedom from the obligations we had trying to maintain “the big house.” We now have time to spend together because the house is (almost) always clean and there is little work to be done. Our vacations are stress free. Now we plan for vacations, we don’t just get one giant check and cash it in (although we still remember those days fondly.) We have given our money a purpose and a place to go. While this took some major getting used to and some serious discipline, it has been one of the most freeing experiences of our lives. Learn to talk to your spouse about finances. Find all my budget printouts in my FREE library. It’s so crazy looking back on my Facebook photo albums. I have always been a picture taker, but in the last 2 years there are more pictures than ever before. Not just sitting on our couch; we are out and about, we are exploring as a family. We are actually living our lives and we are doing it peacefully and without money holding us back. We are still paying off one loan debt and dreaming of working on our mortgage payment next! It hasn’t been easy but it has been extremely rewarding. While our savings isn’t quite what we want it to be, it is bigger than it ever was before. It’s so peaceful when those big moments in life come up (vet bills, doctor bills, flat tires) and we don’t have to stress about where to come up with the money. I know I’ve put a big focus on our older daughter, and that’s because these last few years have been a whirlwind and I can’t help but see just how big of an impact our downsize made for the better. Because she has been forced to come up the stairs to go to the bathroom, she is forced to interact with our family more. Before she had a crippling fear of being around us. She felt unloved and not cared for and a big part of that was the distance that was created by having her living in her own little “cave” totally cut off from the rest of us. There is no doubt in my mind. Now I have seen her struggles face to face. I’ve learned just how deep they run. I didn’t give birth to her, so figuring out who she is has been tricky, especially when her main goal is to hide her true self from everyone. This smaller house made it harder for her to hide. Forced closeness…every teenage girls dream, right? But because of this we have been able to get her help, she comes to us with her problems and is gradually becoming more independent and self aware. She’s finding her place in this world and slowly realizing she doesn’t have to do it all alone. Oddly enough, she still talks constantly of how much she misses the big house. All I can hope for is that someday she sees just how much closeness came from the small one. I hope she realizes this is really the house where she started to find herself, where she reconnected with her family and where her family was saved. I don’t know where we’re headed. But I know we’ll be a lot closer when we get there. Thank you for sharing your family’s very inspirational story. My husband and I lived in a 600 sq ft condo for many years before my son came along, and I know people thought we were crazy. When I was pregnant with my son, we moved into a 1400 sq ft. house and we got comments all the time about how ‘cute’ it was. During our showing, there was another party looking at the house before us, and as they left they kept telling us how small it is. Personally, I absolutely love it! I would not want to go any bigger because as you implied, bigger is NOT always better. I also liked that you mentioned minimalism is just about keeping clutter and stuff down to where you can focus on things you love. That’s where my family is at as well. Great post. Thanks so much Laura. It’s funny I wound up befriending the previous owners of our house. It was their starter home and as they had more kids they wanted to grow with it…which makes sense. It just seems so odd that our home is considered a “starter home” when really it’s everything we need and then some! Good for you in realizing how struggling with payment of the big house was effecting your family. Most people buy way to big of a house and are house poor trying to make the payment every month. Thanks for sharing your story with such transparency. I’m still trying to declutter from two decades of family life and understand how much stress there is in maintaining everything! Yes. That was also part of it. I’ve lost many family members in the last few years and it was amazing just how much they held on to. This is beautiful and “on point!” Tim and I bought our house 14 years ago knowing I was going to sultan home once our baby was born (I was 5 months pregnant when we bought). At that time we also thought we would “up-grade” in 5 years or so. 14 years and 3 kids later here we are promoting the idea of “keeping it simple” to our kids and nieces and nephews. So many people getting caught up in “more” and having serif issues because of it! Cheers lady….love every word of it!! STAY AT HOME, not sultan???? My husband is a big time spender and I just want to get our of debit. I hope that someday I can bring him over to my side! I hope so too! It can be such a tough thing to discuss! I hope you will both be able to find balance soon!